Mark your calendar for this lovely event out in Valley Ford. If you haven't yet visited the best little Mercantile and Wool Mill in the west (opposite the Valley Ford Hotel/Rocker Oysterfellers), Friday, December 19th is the perfect pre-Christmas time to stop by. The store is packed to the rafters with natural, organic, sustainable and US- made homewares, clothing, jewelry, cheeses and gifts. My favorite is the gorgeous all natural bedding made right here in Valley Ford. Already have a copy of Fog Valley Crush? Come out to the Mercantile anyway, it's well worth the short drive and I'll be so pleased to see you! Wonderful review for Fog Valley Crush on Epicurus.com - check it out by clicking here. 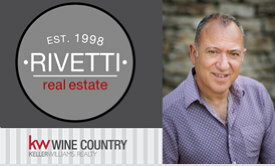 "Frances Rivetti has written an excellent book – Fog Valley Crush, that can only be described as one of the best new books of the year out of the Golden State," – Robert Angelone.